An Organization is a logical collection of Users, Teams, Projects, and Inventories, and is the highest level in the Tower object hierarchy. Access the Organizations page by clicking the Organizations ( ) icon from the left navigation bar. The Organizations page displays all of the existing organizations for your installation of Tower. Organizations can be searched by Name or Description. Modify and remove organizations using the Edit and Delete buttons. Tower creates a default organization automatically. Users of Tower with a Self-Support level license (formerly called Basic) only have the default organization available and should not delete it. Users of older versions of Tower (prior to 2.2) will not see this default organization. “Enterprise: Standard” and “Enterprise: Premium” Tower licenses allow you to create a new Organization by selecting the button. If you are using Ansible Tower with a Self-Support level license (formerly called Basic), you must use the default Organization. Do not delete it and try to add a new Organization, or you will break your Tower setup. Only two Tower license types (Enterprise: Standard or Enterprise: Premium) have the ability to add new Organizations beyond the default. Enter the Name for your Organization (required). Enter a Description for the Organization. Enter an Instance Group on which to run this organization. Select from the drop-down menu list a custom virtual Ansible Environment on which to run this organization. Click Save to finish creating the Organization. Once created, Tower displays the Organization details, and allows for the managing of users and administrators for the Organization. Clicking on Users (beside Details when viewing your organization), displays all the Users associated with this Organization. A User is someone with access to Tower with associated roles and Credentials. As you can manage the user membership for this Organization here, you can manage user membership on a per-user basis from the Users page by clicking the Users ( ) icon from the left navigation bar. The user list from the Organizations view may be sorted by username. 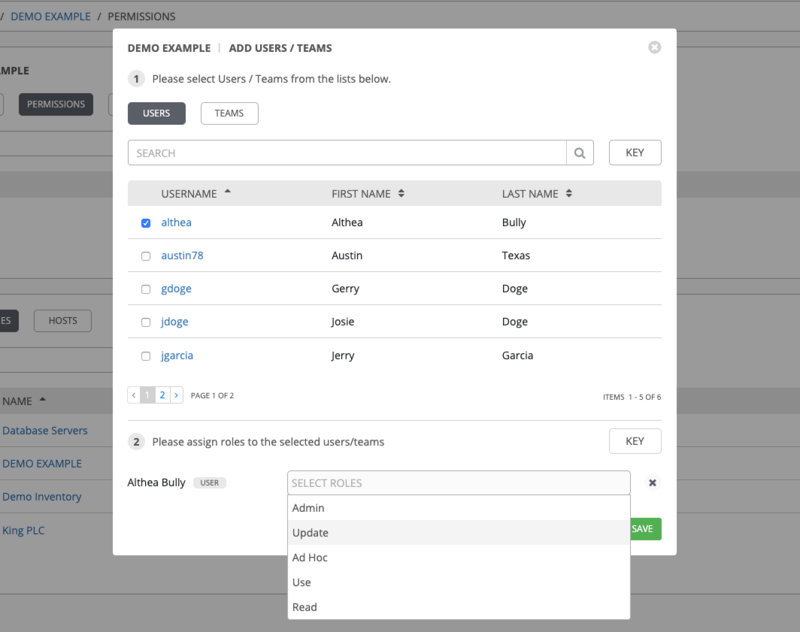 Use the Tower Search to search for users by various attributes. Click Key for using the search, or refer to the Search chapter for more information. 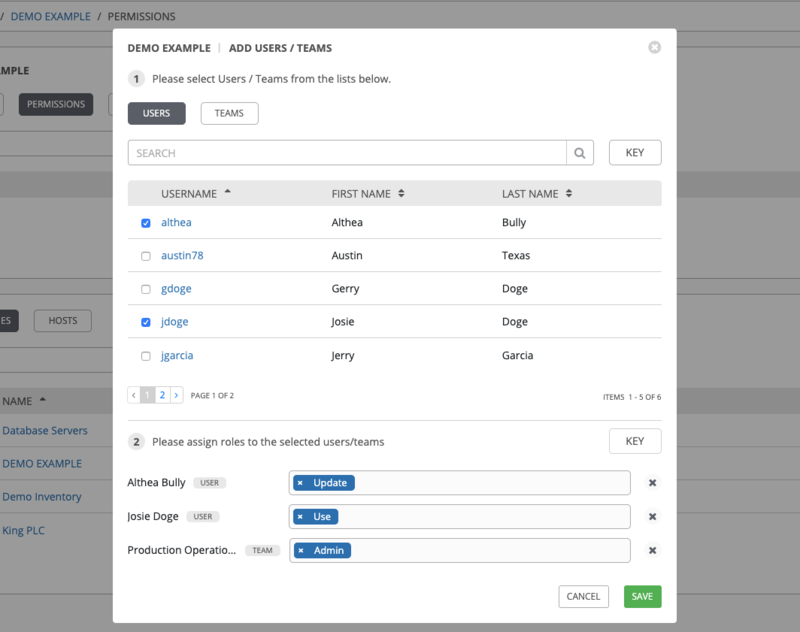 Clicking on a user brings up that user’s details, allowing you to review, grant, edit, and remove associated permissions for that user. For more information, refer to Users. Select one or more users from the list of available users by clicking the checkbox next to the user(s). Doing so expands the lower part of the Wizard to assign roles to each user. 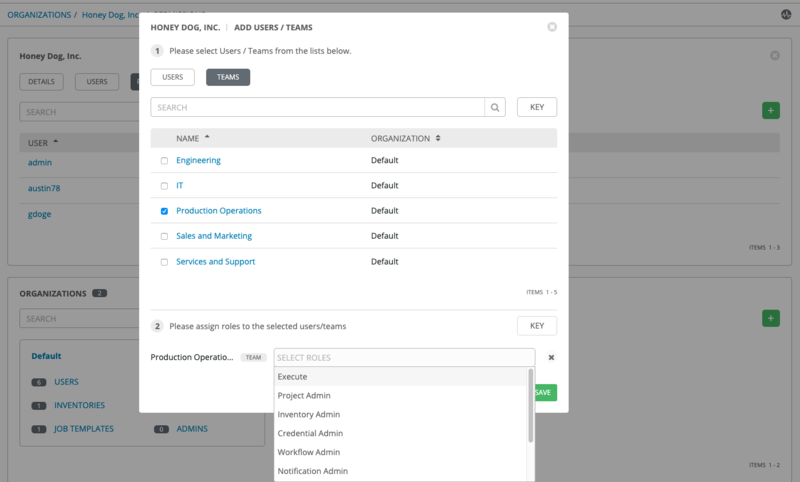 For each user, click from the drop-down menu to select one or more roles for that user. In this example, two users have been selected and each have been granted certain roles within this organization. Clicking on Permissions (beside Users when viewing your organization), allows you to easily manage permissions for this organization. Click the button to open the Add Users/Teams window. Click to select one or multiple checkboxes beside the name(s) of the user(s) or team(s) to select them. 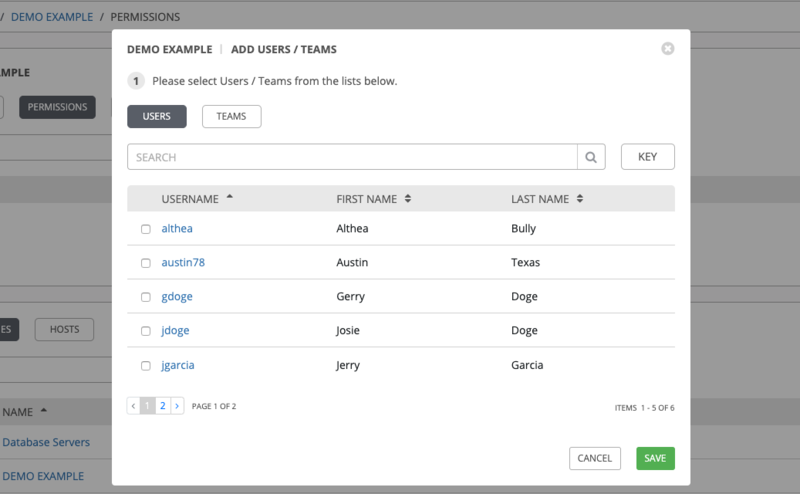 You can select multiple users and teams at the same time by navigating between the Users and Teams tabs without saving. After selections are made, the window expands to allow you to select a role from the drop-down menu list for each user or team you chose. Use the Key button in the roles selection pane to display a description of each of the roles. Select the role to apply to the selected user or team. 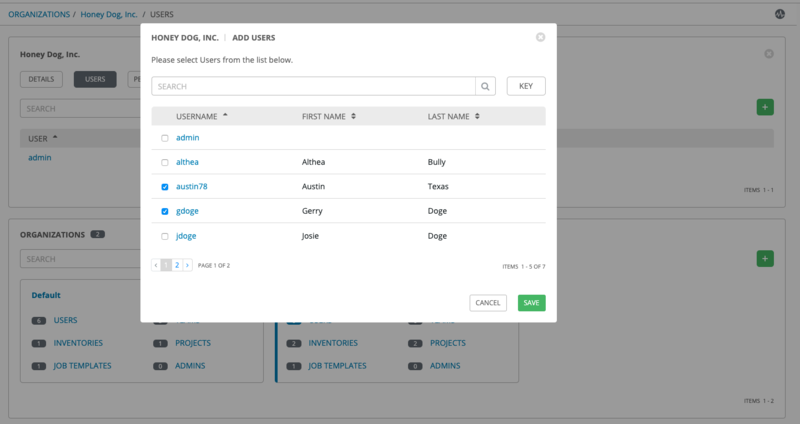 You can assign roles to multiple users and teams by navigating between the Users and Teams tabs without saving. 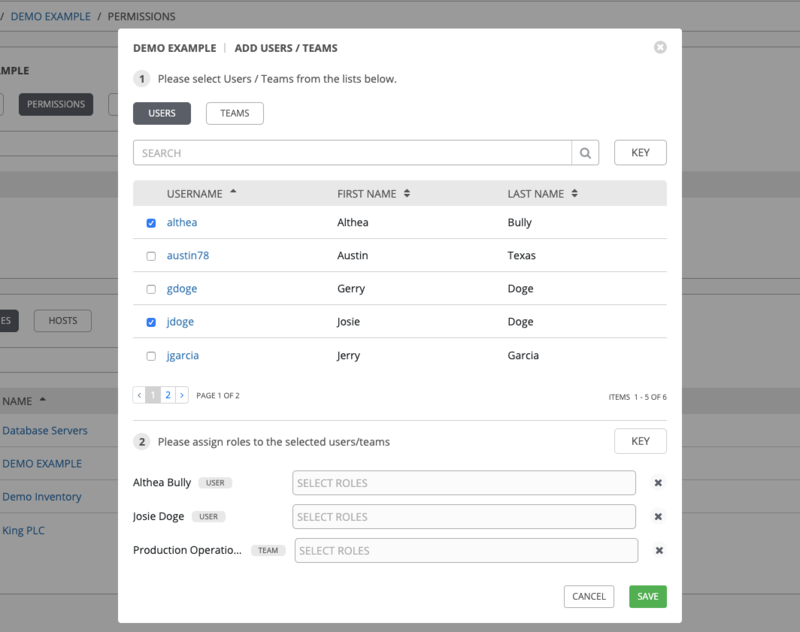 Review your role assignments for each user and team. Click Save when done, and the Add Users/Teams window closes to display the updated roles assigned for each user and team. To remove Permissions for a particular user, click the Disassociate (x) button next to its resource. This launches a confirmation dialog, asking you to confirm the disassociation. Clicking on Notifications (beside Permissions when viewing your organization), allows you to easily manage notifications for this organization. To create a new notification, click the NOTIFICATIONS link from the upper-right side of the notifications list view. Supported notification sources include Slack, Email, SMS (via Twilio), HipChat, and more. Refer to Notifications for more information. 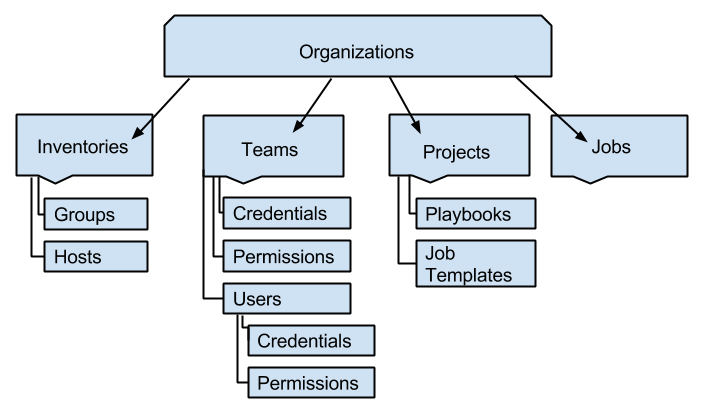 An at-a-glance view of various resources associated with an organization displays at the bottom of each Organization view, called the Organization Summary. Click on each of the categories to view a list of resources associated with them. Some allow resources to be added, edited, or deleted, such as Users and Admins, while others require editing from another area of the user interface. From the summary, you can edit the details of an organization ( ) or delete it altogether ( ).